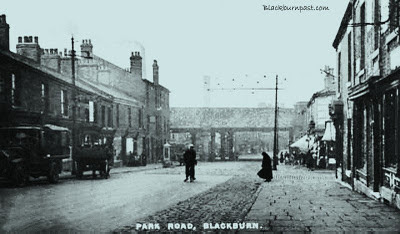 A nice shot of the bottom part of Park Road, looking under the L & Y Railway Bridge (Darwen St Bridge) into Darwen Street. The figure stood on the edge of the pavement is close to the Audley Range junction. Note the white telephone kiosk outside The Castle Hotel. This is a really busy, triple lane, thoroughfare now (takes me ages to get across sometimes) and you couldn't stand in the road these days. When Blackburnnowandthen was still up and running, I posted an aerial photo of this area from the 1960s and from now - it's completely unrecognisable, almost a 100% change. The only thing still there is the bridge. Some of the buidlings in this photo on the right hand side of Park Road were actually still standing as recently as 2000, but were cleared to make way for Staples and Matalan. I'd never have guessed where this photo was! Yeah, you're right Lorcan, a few close to the bridge were still standing around that time. It's hard to visualise it now.